The Young Concert Artists series presented an extraordinary recital by Korean violinist Hahn-Bin on Monday night at the Terrace Theater. 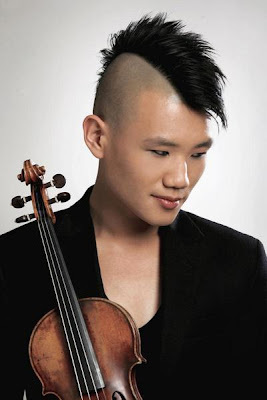 The former child prodigy, now a mohawk-sporting 22-year-old identified only by his given name, is fresh out of Juilliard, where he studied with Itzhak Perlman and Catherine Cho. As if to present his bona fides as a serious artist, his Kennedy Center debut program drew unexpected connections between little-heard modern works and a few older pieces. Last weekend he also gave a short recital and master class at the Levine School. He played a few of his KC recital pieces, as well as some others in a much smaller setting that was well attended. In the master class, he gave some excellent advice in an soft spoken, unassuming and utterly giving manner. And he had some interesting comments about his career choices, life at Julliard and his approaches to performing.